On this date in 1924, a group of Japanese Oomoto* sect members was lined up for execution by a Manchurian warlord — only to be saved at the last moment by the intervention of the Japanese consulate. These inordinately lucky folk were the remnants of a bizarre “spiritual army” under Onisaburo Deguchi, who set out to plant a utopian colony on the Mongolian steppe. 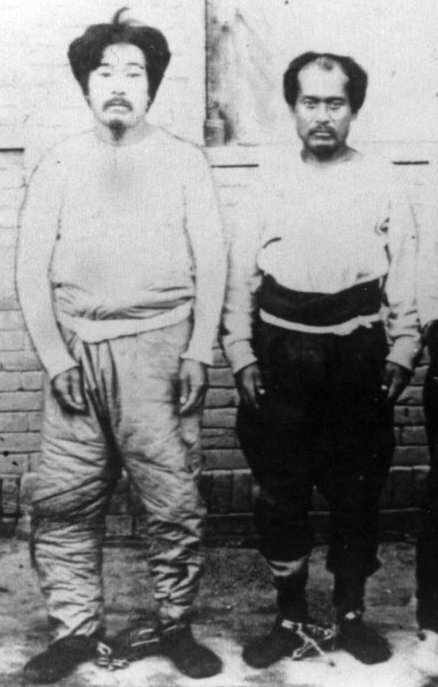 Onisaburo (left) and Ueshiba, shackled together for deportation after their near-execution. Onisaburo’s part of this image looks a little touched-up. Oomoto got started as a splinter sect from Shinto with an illiterate peasant woman named Nao Deguchi, who began receiving spiritual visions in the in the 1890’s. Onisaburo was her follower, and then her son-in-law, and certainly the foundling cult’s greatest exponent. [mediate] between traditional and modern Japan in a time of national transformation. Onisaburo’s imaginative rituals and personal presentation (he loved to star in movies, and to dress as a shaman or Shinto deity) combined enough folk tradition to seem familiar, yet always with a new twist suggesting up-to-date modernity and “scientific” awareness to boot. In private communication with this site, Ellwood compared the advent of new religions like Oomoto to the roughly contemporaneous advent in the west of movements like Christian Science and Religious Science. Both of these, like Oomoto, explicitly aimed to yoke tradition and modernity together. Onisaburo’s brand of evangelical, grassroots millenialism hit the big time in the 1910s and 1920s. It also attracted official censure from authorities wary of deviation from the official Shinto religion. Onisaburo did a short stint in prison for subversion in 1921, and shifted his attentions abroad. “Onisaburo considered himself strongly internationalist in an idealistic way, and therefore was led to challenge the increasing nationalism of his time and even the Emperor himself, whereas many of the other new religions accommodated themselves to the prevailing political currents,” Ellwood observed. Later, Onisaburo would actually be prosecuted for lese majeste for his insufficient accommodation to imperial authority. At any rate, as part of feeling out the proper spiritual direction after his first stint as a ward of the state, Onisaburo and some followers quietly slipped out of Japan in early 1924. They made for Manchuria, then a de facto independent principality under the Tokyo-allied warlord Zhang Zuolin. There, they recruited one of Zhang’s subordinates on a mission to form up a “spiritual army” to invade Outer Mongolia. According to Stalker, this adventure initially had Zhang’s blessing — but he quickly soured on the freelance militia, a leader now calling himself the Dalai Lama, and the gang’s escalating aspiration to unite all of Mongolia on his borders. Zhang surrounded and suppressed the expedition, summarily executing most of the Chinese personnel. On this day, the Japanese too were about to be disposed of. Onisaburo was reciting death poetry. But the execution was dramatically aborted when Onisaburo was fortuitously able to hail a Japanese consular official who protected his countrymen. Scarcely chastened — indeed, the adventure with its miraculous escape drew romantic media coverage back home — Onisaburo returned to Japan to rebuild Oomoto. He would continue dabbling in both internationalism (Oomoto adopted the sometimes-persecuted artificial language Esperanto) and Japan’s right-wing fringe (Stalker says that Onisaburo wisely declined Ikki Kita‘s invitation to finance a disastrous right-wing revolt). Oomoto was violently suppressed in the 1930s, but retained many adherents and still exists today. Martial artist Morihei Ueshiba was one of Onisaburo’s disciples to escape execution this date. Upon returning to Japan, the man parted ways with Oomoto and instead created the martial art form aikido. * Alternatively, Omoto, or Omotokyo. ** And continuing to the present day. While Oomoto is also a going concern, the “new religion” most widely familiar to most readers will be the Aum Shinrikyo sect — notorious for carrying out the 1995 sarin gas attack on the Tokyo subway. This master’s thesis (pdf) sets the scene for new religions (and specifically Oomoto) in early 20th century Japan.